Though scientists are puzzled why the southeastern birds that swell the park’s avian population during cold weather are drawn to these parts of vehicles, we would like to propose a somewhat imaginative explanation. The bird, whose normal role in the biosphere is to remove carrion from the countryside, has slowly been habituated to an oil-rich diet following the aftereffects of the Deepwater Horizon oil spill. Over the years as the oil permeated the biosphere and its flora and fauna, the dead animals the vultures consumed had a rising and measurable hydrocarbon content. Since the birds evolved to remove all sorts of nasty things from the environment, the level of crude in their diet triggered an adaptation to the new conditions. So now that the level of crude oil in the Gulf is slowly subsiding, the birds are taking their need to remove oil-based products from the environment to the next level. Well, maybe if nature could so quickly correct our environmental mistakes and karma was a somewhat more demonstrable law of physics. The problem has been a growing one for the last several years and park authorities have tried numerous ways to drive the birds away but nothing has proven effective, according to a post by Curtis Morgan in the Miami Herald. It is not that the vultures actually eat the parts they tear off vehicles – they nibble on them a bit and then discard them without actually consuming much if any. It may be that, mostly out of boredom, they are simply sampling the local fare. The anti-vulture kits are just a blue tarp and bungee cords that cover up the tastier parts of visiting vehicles. 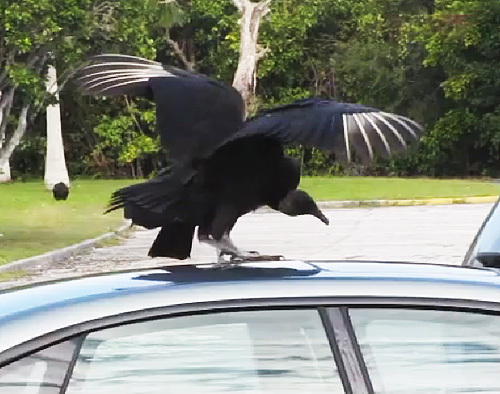 The problem was first reported by Adam Gelber, a consulting biologist and frequent Everglades angler, who returned from a tour of the park to find vulture pooh covering the hood of his GMC Yukon. Worse yet, virtually all the rubber and plastic on the vehicle had been torn away and ripped to shreds by the vandalizing vultures. His insurance gave him $1,850 for the damage before he even discovered the seals beneath his doors were also missing. Apparently, though not highly publicized, vultures causing problems here and there is not a new thing. The aerial scavengers have been known to attacking a wide array of materials ranging from roof shingles to pool screens. The behavior has been under scrutiny for years without any clear understanding of what spurs such actions by the birds. A number of proposed explanations have been dispensed with including our tongue-in-cheek supposition above. Others include the idea that rubber emits an aroma that attracts the carrion eaters, but they have a lousy sense of smell – a definite benefit considering some the things they are supposed to eat. Since there seems to be no cost-effective means of discouraging the behavior park officials have simply taken to warning visitors and selling the anti-vulture kits. That’s how it should be. Visitors at a National Park are in a protected area, dedicated to preserving nature and its denizens. When on their turf, we need to adapt to nature, rather than molding it to suit us.